You’re invited to discuss emerging trends, challenges, insights and market impacts with fellow C-Level decision-makers at our exclusive dinner. Forrester’s latest survey, based on responses from 590 decision makers from Europe, the Middle East, and Africa, explores the strategies businesses need in order to survive the digital transformation they are facing right now. The survey shows that 73% believe their current business model will disappear within the next five years due to the digital revolution. Customer loyalty means less – while customer experience means everything. To be competitive, companies in all sectors need to strengthen their digital foundation, so they can use data from any interaction with the customer – and use it wisely. 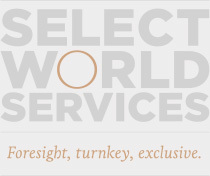 JOIN US for senior-level conversations, exchange of ideas and networking at Select World Services’ Exclusive, intimate, by invitation only CXO dinner The New Frontier – Unlocking the Power of Data. And VPs, Head of Departments, and Heads of Business Units with responsibilities in Finance, Credit, Risk, IT Risk, Digital, Digitization, Innovation, Customer Insights, and Business Intelligence.